MistAir, in Phoenix, AZ is a top quality manufacturer of custom misting systems for Arizona, California, New Mexico and Nevada. 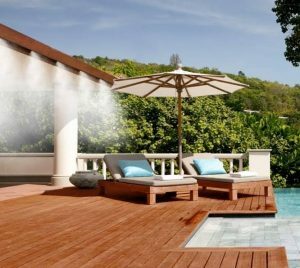 The company branched out from its pressure washing company because of the need,and market design for improved misting systems which would cool better and more efficiently. MistAir is a one stop shop – not only do they design, build and install their systems, they also service & repair all types of systems as well as sell parts in their phoenix factory. MistAir’s misters are recognized for being best in the industry because of their proprietary parts and pumps which cool via high pressure misting, rather than producing water droplets – which allows them to provide a 6-year Unconditional Warranty, which is unheard of in the pressure washing and cooling industries. At the end of 2016, MistAir hired our digital marketing agency to improve their visibility and prominence in online search to reach more residential and commercial clients. After extensive keyword research, new website development, 10 SEO keywords were selected and the website was redesigned and rewritten in order to create more leads. In addition, a PPC campaign was used to kick off the campaign. Furthermore, as part of the off-page optimization process, we conduct on-site content marketing link building syndicated on sites such as : wordpress, weebly, blogger, and tumblr. Since execution, their brand recognition has dramatically improved and the client has received 300 quality leads which have resulted in significant more business. eSpark Marketing’s contract was renewed and continues to be retained for advanced online marketing for lead generation, analytics as well as SEO Consulting. If your business is needing more leads or brand awareness, please reach out to 602-845-0089 for a discovery call!